An interactive video installation in which a Kinect camera responds to audience gestures by manipulating video, creating an interactive and highly individual visual storytelling experience based upon the theme of intimacy. Each of the four window panes reveals a different aspect of the story. 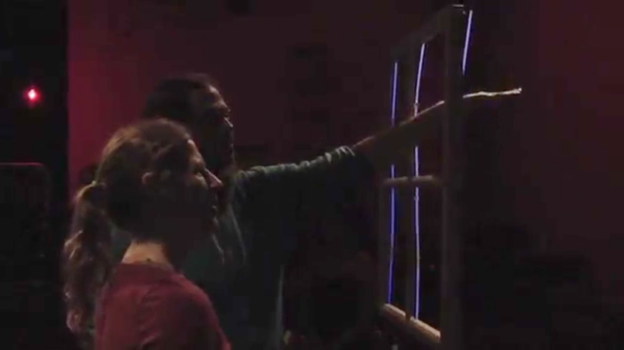 As the audience members put their hand through the window frame a Kinect camera tracks their horizontal and vertical movement, as well as the depth of their hand in the frame. Moving left to right speeds and slows the video playback; moving up and down changes the visual overlays of the video; moving deeper into the frame changes the visual manipulation of the video through various filters. Deep Root Dance Collective Resident Artist Workshop 2014. The Garage, San Francisco, CA.